Today's business environment requires passion to succeed. Your competitors have it. Your customers have it. 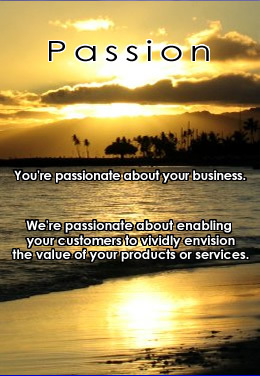 How are you demonstrating your passion to serve your customers? Are your clients impressed with your image? Can they quickly & easily get a glimpse of you and the way you run your business? Akaku's mission is to project the passionate vision you have for your company on-line in a simple, easy, & hassle-free process. You'll never hear any techno-babble from us, just clear and concise descriptions of the steps necessary to reach current and future customers via the most powerful interactive medium in the world - the internet. Our services range from a basic on-line presence to sophisticated e-commerce sites. Our process begins with a free consultation identifying your goals and needs. We'll review your industry and analyze your competitors to ensure the project encompasses all facets of marketing and business development you expect from the internet. Take a look at our portfolio and contact us to start growing your business by leveraging the power of the World Wide Web.